King County collects monthly water quality samples on the Snoqualmie River along Route 203 in the town of Duvall. King County is not currently conducting benthic macroinvertebrate or stream sediment monitoring in the WRIA 7 Routine Streams Monitoring Program. The Snoqualmie River occupies two distinct geomorphic provinces. Above the 270 feet high falls near the City of Snoqualmie, Washington, the river drains steep forested mountains and is alluvial in the valley bottoms. Below the falls, the river meanders for more than 40 miles through a post-glacial valley that is dominated by agricultural land uses. At its confluence with the Skykomish River near the City of Monroe, Washington, the two rivers form the Snohomish River (Pess et al., 2003; Kaje, 2009). The Snoqualmie mainstem features diverse land uses in unincorporated areas as well as portions of the Cities of Duvall, Carnation, and Snoqualmie, Washington. Excluding upstream watersheds sampled in this program, the mainstem Snoqualmie site drains nearly 68,000 acres. Rural residential land use, agriculture, small-scale forestry, and other activities take place in some of these areas. Below Snoqualmie Falls, almost the entire floodplain is designated for agricultural land use. The floodplain itself is approximately one mile wide along much of the river and over two miles wide downstream of Duvall. The agricultural floodplain is traversed by countless ditches and tributaries that flow directly into the Snoqualmie River (Kaje, 2009). In total, land use is mostly forest and developed, followed by scrub. Forested areas are mostly evergreen and developed lands are mostly a mix between low intensity and open space. Remaining land use consists of agriculture, scrub, wetlands, and other (barren land, grassland, and open water). As a mainstem area, the river naturally hosts all anadromous fish species that are known to reside in the basin, including four species of salmon, winter and summer run steelhead, as well as bull trout. Tributaries within the floodplain provide rearing habitat and high-water refuge areas for juveniles of many species, including Chinook salmon (Haring, 2002). State water quality standards were revised in 2003. The Snoqualmie River at Duvall is now categorized as “Spawning, Rearing, and Migration Habitat” for aquatic life use and “Primary Contact” for recreational use. As part of the updated water quality standards, portions of the Snoqualmie River have been assigned an additional “Supplemental Spawning and Incubation Protection” temperature criteria of 16 °C. 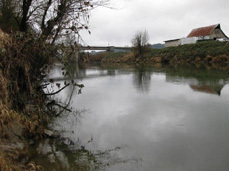 Multiple reaches of the mainstem of the Snoqualmie River are listed on the Washington State Department of Ecology's (Ecology) 303(d) list for violations of toxaphene and polychlorinated biphenyls (PCBs) standards (Category 5). The river has two types of EPA-approved total maximum daily load (TMDL) plans in place and implemented: a Snoqualmie River Watershed Multiparameter TMDL plan for FC bacteria and DO; and a Snoqualmie River Watershed Temperature TMDL (Category 4a). A Water Quality Index (WQI) rating system was developed by the State Department of Ecology that evaluates several water quality parameters and gives a single rating of “high,” “moderate,” or “low” water quality concern. To see Snoqualmie River ratings compare with other stream sites, please visit the Water Quality Index webpage. p> King County is not currently operating any stream, rain, or temperature gages on the mainstem of the Snoqualmie River in the City of Duvall, Washington. However, the U.S. Geological Survey (USGS) does operate a flood gage on the Snoqualmie at Duvall (12150400) and a stream gage further upstream in the City of Carnation, Washington (12149000). While King County is not conducting benthic macroinvertebrate monitoring on the South Fork of the Snoqualmie River as part of the WRIA 7 Routine Streams Monitoring, the Washington State Department of Ecology collected benthic data from the mainstem of the Snoqualmie River in 2009. To see this data, please visit the Puget Sound Benthos webpage.